ReezaFRATzitz is your golden ticket to distortion dreamland. Chock-full of roaring amp-like dirt tones, this pedal and its highly versatile controls will put some serious sizzle into your sound. 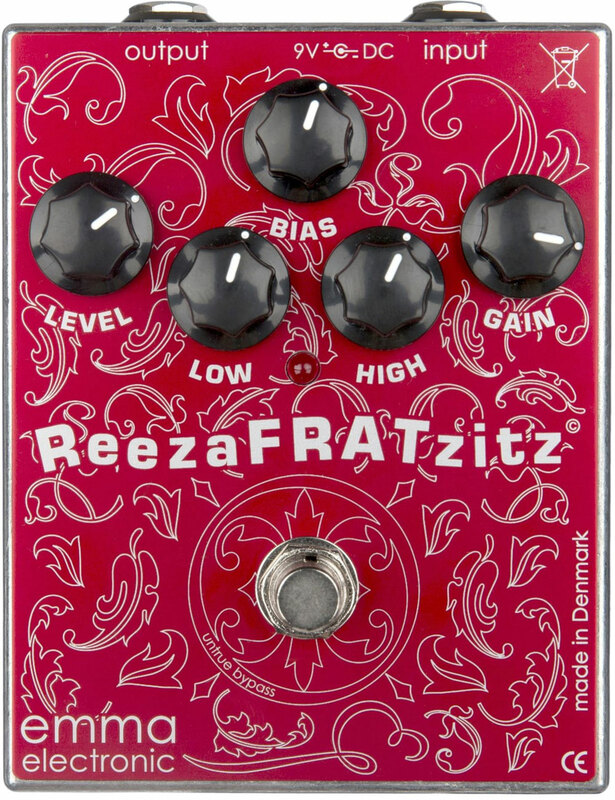 From bluesy growls to grinding and screaming distortion, ReezaFRATzitz is sure to supply you with the super-sonic firepower you need. If you like it loud and wild, then ReezaFRATzitz should instantly feel like home. Bursting at the seams with the DNA of rock, this pedal was created to give players the tone and touch-responsiveness of a cranked tube-amp right in front of their feet. The magic to this lies in the unique Bias control, which lets you alter the harmonic content and attack response of the pedal from that of a Class-A to a Class-B amp and anywhere in between. Combine that with the highly interactive Bass and Treble EQs, plus the pedal’s extremely wide gain-range and you’re ready to serve up anything from warm and vintage-sounding drive tones to tight modern distortion tones, all while maintaining the integrity of your core sound. So all that’s left to do now is plug in and rock out!